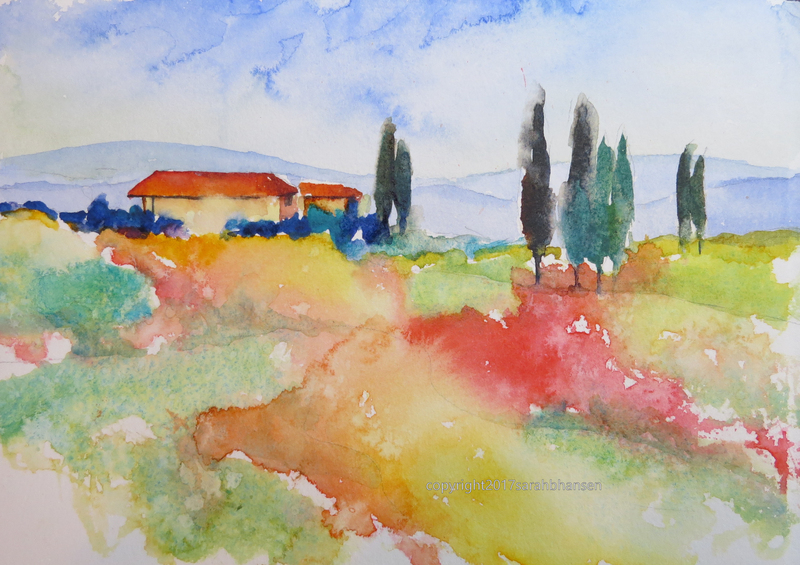 You are invited to tour beautiful Tuscany as you learn to paint in watercolors! Sarah and Gina of Gina’s Italy have teamed up for your trip of a lifetime. Awaken your inner artist as you experience the sights, history and people of Tuscany. For 8 days enjoy visits brimming with cultural experiences that include great food and wine plus fabulous architecture. With Sarah Hansen, watercolor artist and art instructor, you will learn how to paint your dream-filled moments as you create watercolor images of your private view of Tuscany. Some of the wine aged for 30 years! Read about 2017 Paint Tuscany Tour: Day 1, Day 2, Day 3, Day 4, Day 5, Day 6, Day 7, Final Day. Look at this view from a small hillside town! Tour a local winery, eat fabulous food, explore Florence, stay in an rural farmhouse, and explore surrounding hill towns. Oh, by the way? The shopping is AMAZING! Learn watercolor techniques and create your own paintings of the surrounding beauty of Tuscany. No experience in art necessary as you learn to move paint on paper and mix vibrant colors while creating your memories of Tuscany. Embrace your inner artistic soul and create watercolor paintings of Tuscany. Each day will offer an experience of Italy’s panoramas, art, architecture, food, people and medieval towns. Engage in guided art sessions and relive the events of your day. Allow your mind to rest in the recall of colors, smells and sounds and paint your vision of Tuscany. Read about last year’s 2016 Paint Tuscany Tour: here and here. Reserve your spot today by contacting Sarah or Gina. Receive tour updates by clicking on the follow button on the sidebar of this page. Interested but not sure? Fill out the form below and you will receive newsletters and personalized tour updates.